On September 10, 2013, Mr. Buti Cecil Masoka, Director of Multilateral Cooperation, Department of Science and Technology (DST), the Republic of South Africa, and Ms. Eudy Nomusa Mabuza, who was recently assigned as Minister-Counsellor for Science and Technology, Embassy of the Republic of South Africa paid a courtesy visit to Professor Takashi Onishi, President and Dr. Fumiko Kasuga, Vice-President in Charge of International Activities of Science Council of Japan (SCJ). SCJ has been enjoying friendly relationship with the Embassy of the Republic of South Africa; the recent exchanges include the courtesy visit of Ambassador H.E. Dr. Mohau Pheko on September 2012. 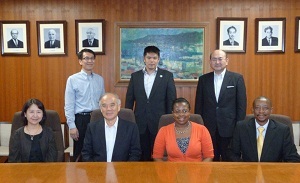 During this visit, Ms. Mabuza introduced the upcoming bilateral meeting between the representatives from DST and Japanese representatives concerned, which will be held during the STS forum annual meeting in October 2013 in Kyoto. Then, President Onishi and Vice President Kasuga introduced the SCJ's collaborations with the Republic of South Africa; the Academy of Science of South Africa participated in the activity of G-science Academies as one of the signatories of their Joint Statements 2013 toward the leaders of G8 Summit; SCJ exhibited the Joint Statements at TICAD V (Tokyo International Conference on African Development V) in June 2013 in Yokohama; Professor Daya Reddy, President of the Academy of Science of South Africa and Co-Chair of InterAcademy Council (IAC) will honorary participate in the International Conference on Science and Technology for Sustainability to be held in SCJ in October 2013. Mr. Masoka, predecessor of Ms. Mabuza, explained the DST's commitments to promote their bilateral cooperation, while emphasizing that they focus on Japan as one of the strategic countries, along with Russia and Belgium (Brussels as the host city of principal EU institutions) and they directly dispatch their delegates to the embassies of those countries. As the ICSU Regional Office for Africa is based in Pretoria, there were active exchanges of views and opinions also on the resent involvement of both countries in ICSU and other international scientific organizations.